If you're looking for a family hotel in Cesenatico , come and discover the Club Hotel Gallia, a real family hotel near the sea, with many services for parents and children. The hotel Gallia is a hotel in Cesenatico for children and it is as though, with the small welcome gift for all the children, with the smiles of the animators, the playground and a swimming pool for them. Parents can enjoy a relaxing holiday, enjoy the wellness area and the wonderful private beach just a few steps from the hotel. In addition, for any case will be able to count on the availability and the expertise of our staff. The hotel Gallia is in a consortium with the product quality the Italy Family Hotels, which recognises that the services offered to the quality standard required for a true family holiday. For years the Italy Family Hotels, recommended to all its members and to all of its clients the hotel Gallia, because we can really feel at home! Small cutlery and plates "baby"
Looking for a Relaxing vacation? Baby Fruit Drinks: all day in the hotel, bananito, peschito, and fragolito. Drink cool or room temperature , fruit-based, no dyes, designed for your child. Drinks are provided at the plug from the dispenser, the size, height, safety, and ergonomics are studied in function of the needs of our little guests! 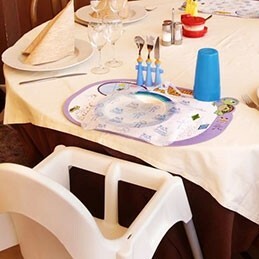 "We just stayed at this property, I, my wife and my 6 year old son, we had a great time, the food is of very good quality and extremely wide choice (compliments to the chef Vincenzo), it offers everything we were looking for, from pools the convenience of being able to have lunch at the beach ... "
A true 'superior' for a super holiday! "The animation is polite and unobtrusive. Pablo, the animator, passing every night through the tables to chat with all the guests, and then after dinner makes baby dance for children. Even at the beach, along with other kids every morning and afternoon offers various activities. We have seen that there is a girl who then deals specifically with the children's club for the little ones. " "A week of relaxation where the word reigns supreme ALL INCLUSIVE: Beach towels, pool towels, bathrobes, mini bar, unlimited drinks ... bicycles, that you want? From great food great chef Vincenzo and his staff to the kindness of Catherine in the bar .... Paola and Alessandra the kind reception and super sweet with all ... "
Our best offers for families with 1 or 2 children always free, and discounts of up to 17 years of age. Discover reductions for small children, the services included and the convenience of All Inclusive packages. "I could appreciate the comfort of the spa area (sauna, jacuzzi and small gym) available for free for hotel guests. bike park well stocked and in excellent condition. WiFi is good at the hotel and on the beach." "Mention spéciale au chef qui a été en mesure d'exploiter tous les plats nous ajoutant une touche spéciale qui les rendait unique. N.B. Oubliez le régime alimentaire et profiter de cette cuisine de qualité "